I am a sucker for gold and coral colours. This dress has them both paied with a neutral and a touch of pink. Beautiful! What more can you ask in terms of a great colour combination? I decided to use these colours but sparingly. So here is my take on the challenge. I have used images from A Day in Paris stamp set by Penny Black. I have stamped them on the textured side of Tim Holtz watercolour paper using Archival Jet Black ink. I love this ink for it true black colour and great for watercolouring as the ink is water proof. Anyway, I then used distress inks to watercolour my images. I used Victorian Velvet, Worn Lipstick, Spiced Marmalade, Dried Marigold and Tea Dye distress inks to blend and colour the images. I have used some of the inks to spatter. For the touch of gold, I have added some Heidi Swapp Gold colour shine spatter, a strip of gold card stock and gold sequins from Pretty Pink Posh. I have trimmed and mounted the stamped and water coloured panel to the card front using foam adhesive with a strip of coral coloured chevron pattern paper peeking towards the bottom. 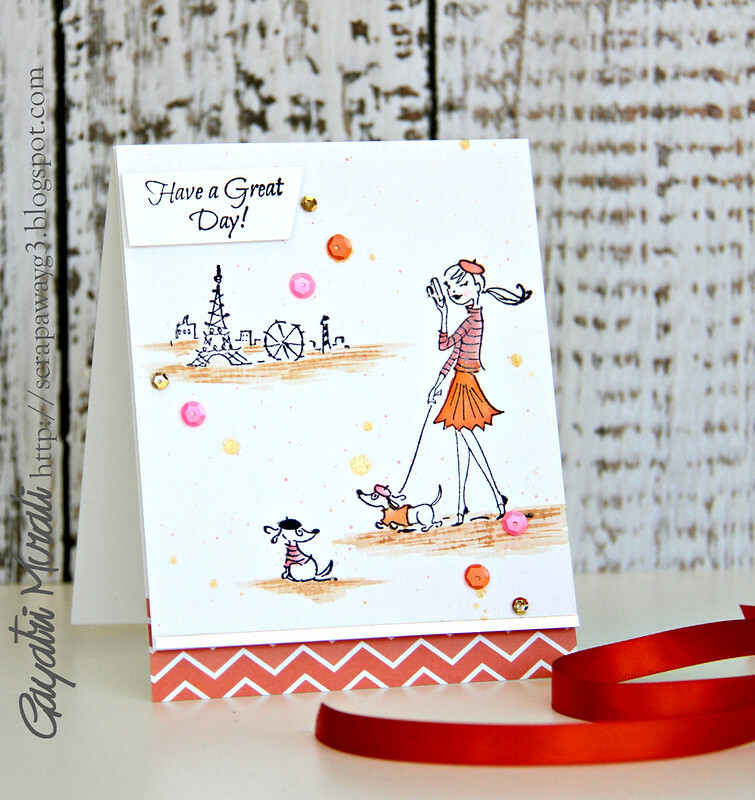 I absolutely adore this stamp set from Penny Black and the colours from Runway Inspired Challenge. Check out Runway Inspired Challenge Blog for more DT inspirations. 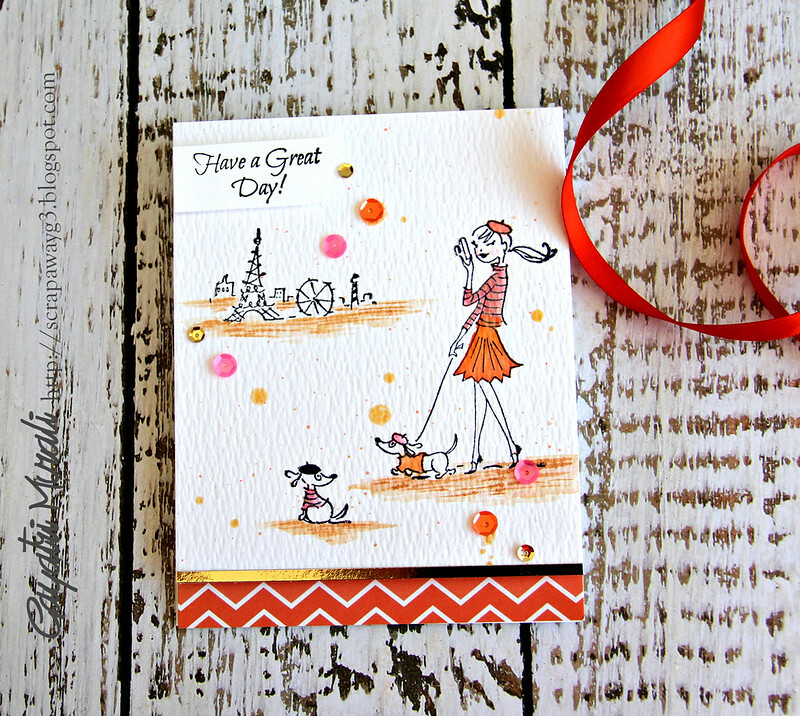 What a beautiful combination of colors, love the dazzling image along with chevron border and a touch of gold strip! Very sweet scene and those colours are gorgeous. I adore this.. oui, oui! !